The MSI CX700-021UK is a large, comfortable machine which – unsurprisingly at such a low price – offers little wow-factor, but may be worth a look for those after an entry-level desktop replacement system. The 17-inch screen dominates proceedings but, despite featuring a 1600 x 900-pixel resolution, is not as sharp as we expected. It does boast a 16:9 aspect ratio though, so it is less likely that you will find black lines framing your films. A Super-TFT screen is in place, but it's not especially distracting in bright light. Chassis design is sufficient and employs MSI's Colour Film Print technology which aims to protect the laptop from scratches and fingerprints. This works to a certain extent, with markings showing up less prominently than they would on similarly shiny rivals. Build quality is generally decent, but we found a few of the chassis' panels bent under light pressure. The matt-black keyboard is great to use and there's very little flex evident. The keys travel a comfortable distance, are tapered and are also nicely spread out to give a fluid action. Due to the size of the laptop, MSI has found room to include a dedicated number pad, which is useful for those who regularly input data. A row of hotkeys above the keyboard provide access to the integrated webcam (suited to video chatting) and also MSI's ECO engine settings, providing specific pre-set power profiles to help you balance your performance and battery needs. The dual-core Intel Pentium processor is joined by 4096MB of memory, but everyday performance is a little poor. 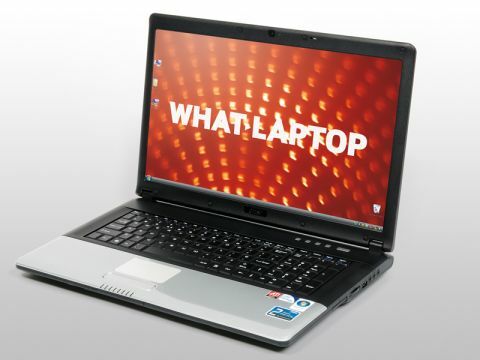 Nevertheless, office work, email and internet browsing will run smoothly enough and, thanks to the dedicated ATi graphics card and 512MB of video memory, light video and photo editing is definitely possible. The inclusion of a 500GB hard drive is very welcome and will easily store an entire family's digital content, as well as provide good future-proofing. This laptop is also pleasingly light for its size, weighing in at only 2.8kg, so you'll be able to carry it around with no issue. The 133-minute battery is less impressive, however, and falls below the three hours we expect. 802.11n Wi-Fi and Gigabit Ethernet provide the fastest wireless and fixed networking currently available, and there's also VGA and HDMI ports providing flexible options when hooking up to an external monitor. Three USB ports for adding peripherals round off the specifications. The MSI CX700-021UK is a decent laptop, but the lack of power may be an issue for you, and it may only appeal to those with basic user requirements.